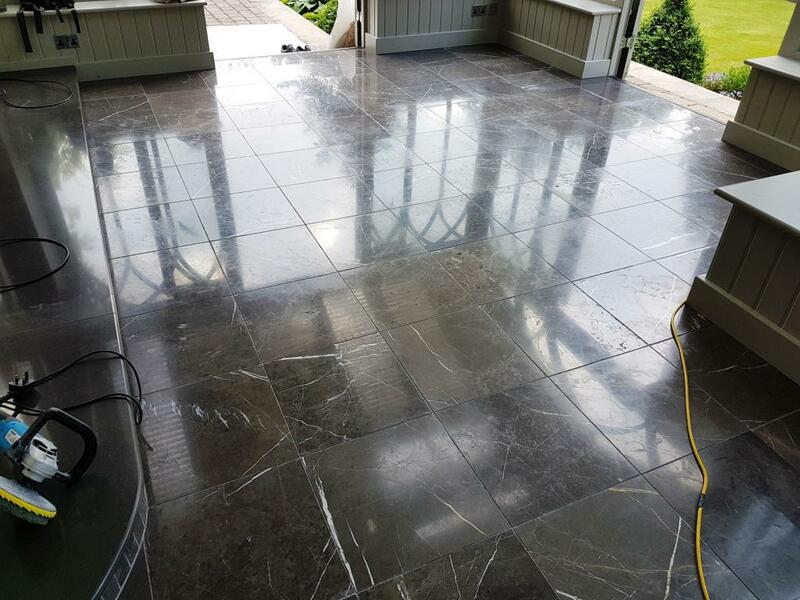 These photographs are of a large Black Carrara Marble floor at customers house in nearby Harrogate, a North Yorkshire spa town which is steeped in history. In-fact the town became known as ‘The English Spa’ in the Georgian era, after its waters were discovered in the 16th century. In the 17th and 18th centuries its ‘chalybeate’ waters (containing iron) were a popular health treatment and the influx of wealthy but sickly visitors contributed significantly to the wealth of the town. When I reached the clients’ property she showed me to the Orangery. This was a lovely garden room and it had a large and expensive Black Carrara Marble tiled floor installed. The floor was installed some time ago and had since lost some of its shine and lustre which is not unusual as foot traffic on the floor will wear down the shine over time particularly as it was a dark black colour. I was aware that Carrara Marble is usually polished at the factory and re polishing to achieve the same high-end finish requires the use of some very expensive machinery which most Tile Doctors including myself don’t carry. However, I am always up for a challenge and not to be beaten there were a couple of things we could do to improve the appearance of the floor. Carrara Marble by the way gets its name from the city where it’s quarried which is in the province of Massa and Carrara in the Lunigiana, the northernmost tip of modern-day Tuscany, Italy. It is not surprising that such a beautiful material comes from such a lovely place! In use since Roman times Carrara Marble is an expensive, high quality marble used in sculptures and building décor. So, after discussing all this with the customer and a little history, l set about giving the tiles a spray burnish with a very fine 3000-grit diamond burnishing pad and a little water sprayed onto the Marble. The 3000-grit pad is a very fine grade that would not damage the surface of the marble, simply restore the shine. This pad had the desired effect and did a good job of bringing back the deep polished look of the floor. 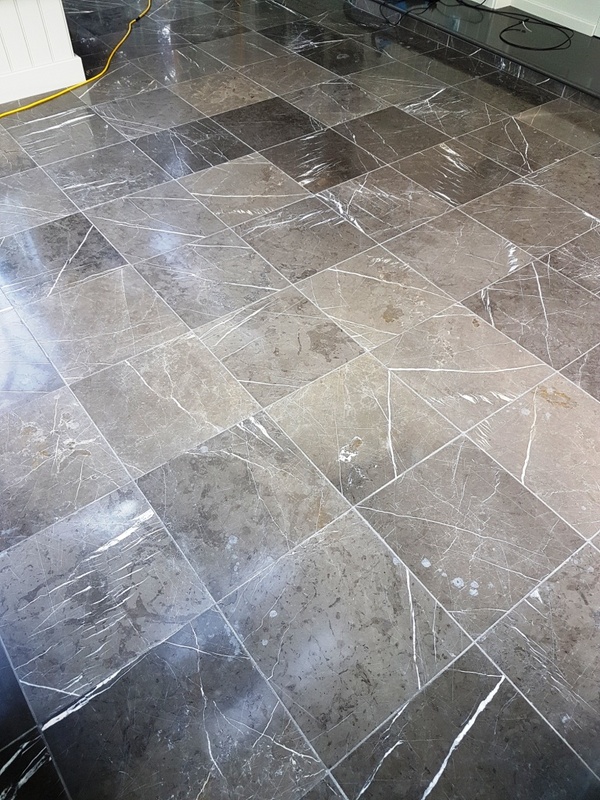 Once I had finished the spray burnish and ensured the floor was dry, I applied two coats of Tile Doctor Colour Grow, this product is an impregnating colour intensifying sealer that provides durable stain protection by occupying the pores in the stone thus preventing dirt from becoming ingrained there. I chose to use this primarily to seal and protect the stone but also to enhance the beautiful natural colours. 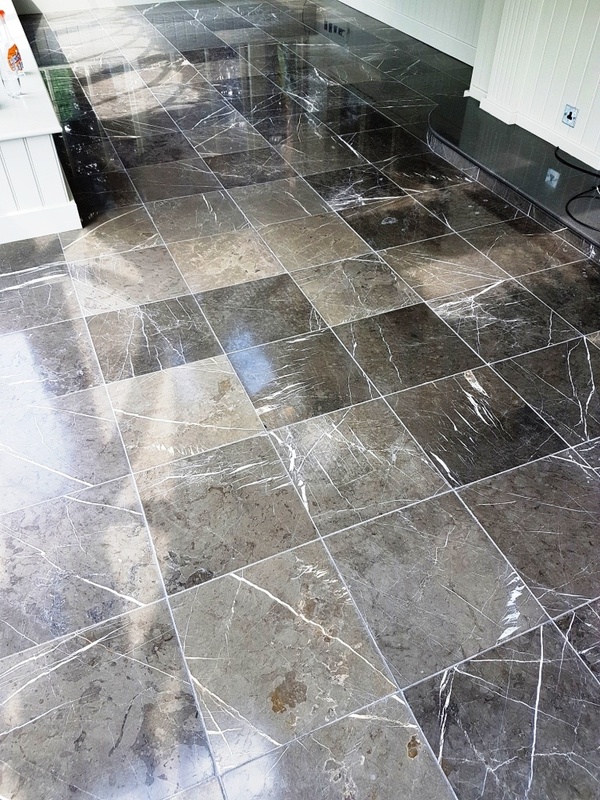 The job was completed in a single day and the result was a big improvement on the dull Marble tiles I had come across that morning. It’s probably difficult to tell from the photographs but I felt the combination of spray burnishing and sealing had completely changed the appearance of the floor. 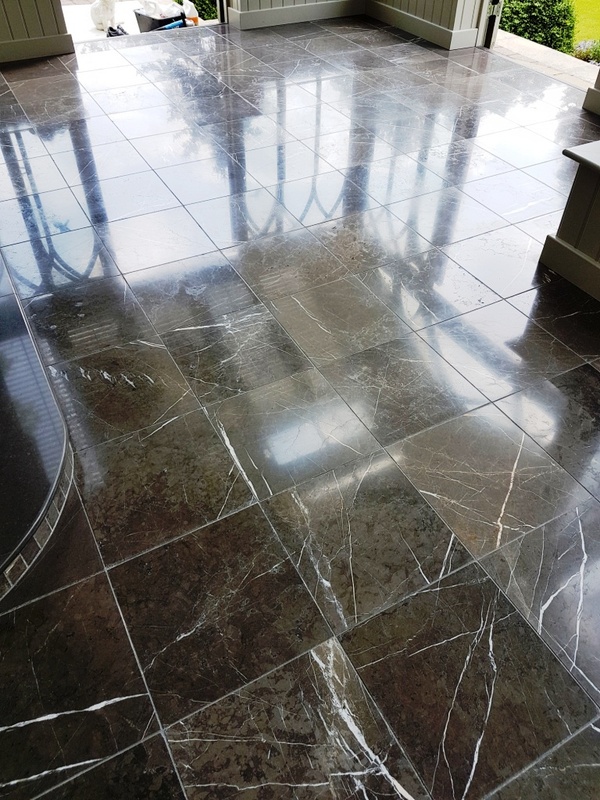 The customer was very happy indeed, the floor looked much brighter and with the sun shining through the huge area of glass, the highly polished look had definitely been restored.